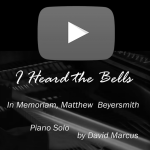 The music video for David Marcus’s stunning I Heard the Bells (In Memoriam, Matthew Beyersmith) showcases his original composition. It features his precise and moving piano playing. He is a multi-instrumentalist and professor, and we are also currently working on a website build for his portfolio and teaching. This music video was recorded in only three takes at the surreal 800 East music studio, here in downtown Atlanta. Martin Kearns was the audio engineer and he set up a series of mics around David to record both his playing and the ambient room. We brought in two cameras and studio lights, and then sat back and watched this masterful playing and musicianship. We worked silently to capture facial expressions and quick moving fingers. After the audio recording was complete, we did a few rounds of music notation details. David had imagined the sheet music to play across the screen as certain parts of the song moved, and I loved working with his ideas to come up with this ephemeral, dizzying music video that ebbs and flows between layers of this soundscape. “I Heard the Bells” was premiered in Tallahasee, Florida, in 1996, and has been performed at Emory University, Clark Atlanta, University, and Morris Brown College. 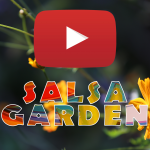 Official Music Video Production for Elise Witt’s My Salsa Garden!! For Elise Witt’s My Salsa Garden Official Music Video Production, we happily danced in her inspiring garden, played in her flowers and danced with the neighbors. I was tickled to edit the footage, from Mick’s jaw dropping pepper squeal to little Naya jumping in and out of camera. Creating this music video production (this is the first release for three that we are creating together) is turning out to be really fulfilling, creative and exciting work for me. This might all be obvious, given my love for music, storytelling and camera work, but this is the first opportunity I have had to create a series like this. My previous film projects have all been more documentary, and this is a little bit more conceptual with a storyline (kind of)! A real short film, telling the story of Elise’s glorious Salsa Garden. I am so excited to share the beautiful fruits of our labor and play. This video was recorded over two different shooting days and on each we used two different cameras. The first, we really focused on lyrics and garden imagery. Then, on the second, we brought out friends, family and neighbors to play! When editing the footage, we were able to select the camera that Elise’ loved the most for portrait images of her, making sure that she felt beautiful and inspired by her own telling of her song. Our relaxed shooting style helped us to capture the quirky air instruments and camera jump ins! Here are the official music video production credits!